Well, we came home from our friends house on New Years eve and rang in the new years (never have I felt like such an old lady) by making Alton Brown’s overnight oatmeal recipe. As patience seemed to be our issue in the morning, putting oatmeal in a slow cooker the night before and waking up with it ready to go seems ideal. And actually it is. It’s perfect. However, 1 cup of oats to start made more oatmeal than we could eat ourselves. So, we had our share, Yohji (our dog) had a helping, and the chickens finished up what was left. They celebrated new years day with oatmeal and new sweaters that my mother knit them for Christmas. 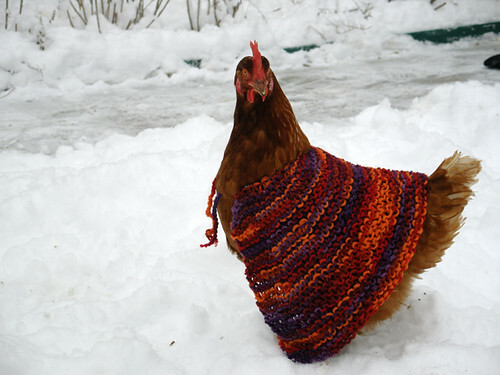 If you need sweaters for your chickens you might want to get in touch with her. 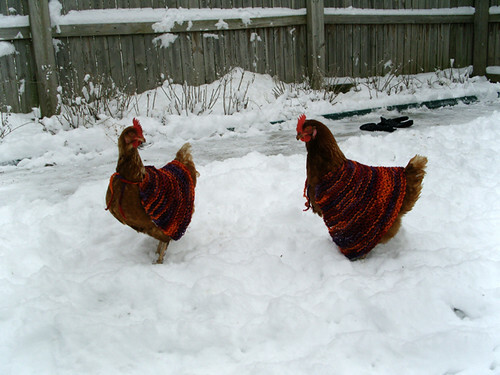 I don’t really know anyone else who knits chicken clothes. Tagged backyard chickens, chicken, Chickens, oatmeal. Bookmark the permalink. 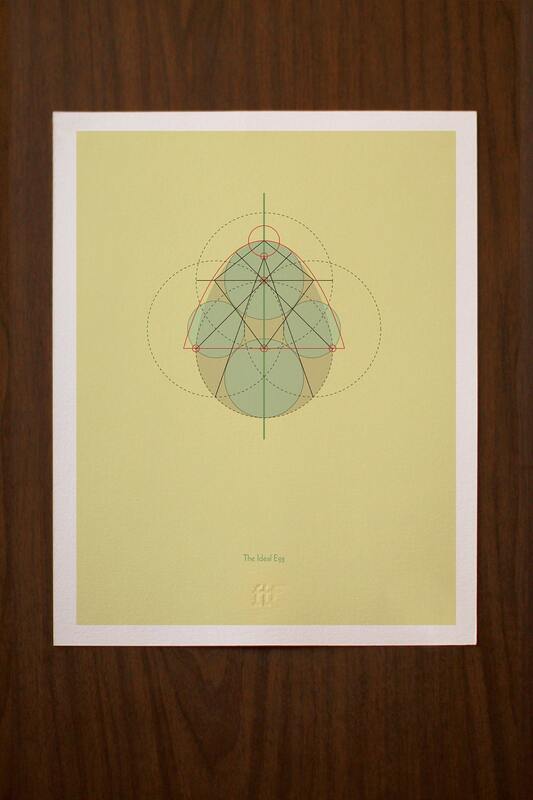 Put me in touch with your Mom…I might need 2 of these. It will definitely help with the cold Idaho winters. These sweaters are so cute. I would love love this pattern! I’ll be pressing my mother on this chicken sweater interest. I must admit, they’re pretty basic. More of a cape than a sweater actually, with crocheted ties. 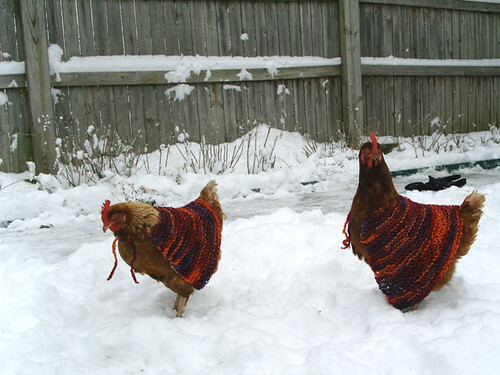 And as fun as they are, functionally, we didn’t actually leave our chickens in them and they seemed to love running around in the snow au natural. I’ve made saddles for my ladies. They were balding due to overmating. I don’t know if it really helps with the cold nights, I’d like to think it does. I love the knitted capes tho! I knit and it looks like a dewrag or kerchief. Just a triagle with ties maybe? OMG! Meagan, that is AWESOME!!! I’m gonna have to get my crocheting friend to make this for me now. Maybe I could figure out a knit version. Thank you for sharing!! I loooove it! Your mother’s sweater has gone more or less viral on facebook this week. 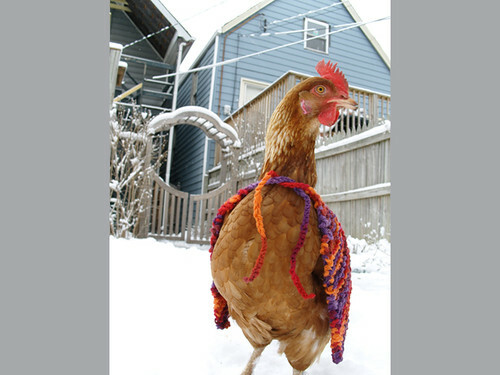 Please have her write down the instructions for us so we can all knit these for our little flocks. for Ruby, Rhoda, Rusty, Barbara, OddBall, May, Raven, Lenore, Mrs. Bankhurst, The Little Grey Hen, Foghorn Leghorn, Sparticus, Haggedorn, Sgt Pepper and the five chicks. So, mom says its just a blunt top triangle. She cast on so as to start with about one foot and then decreased on each side as she moved up the cape. So the bottom was about 1′ wide and the top a couple of inches. Then she crocheted a couple of ties at the top. Sorry, that’s the extent of the details but, it was really that simple. Good enough for a funny photo. I would warn that it may not be safe to leave them unattended in these. The prints are available in a few different sizes and represent some of the ways chickens have been a part of our lives. Can’t wait to build our next coop. We just got settled into our new house and are designing a coop. We can’t wait to get our little friends back. All our best to the toughest city chickens around…Papoo and Chalmers.